Click on a song title to listen to an MP3 clip. Ken's love affair with the poems of Les Barker and his putting them to music has been recorded on his new CD with full arrangements. Twenty songs where recorded with the help of many talented and creative musicians who helped create beautiful arrangements that complements Les's lyrics and my melodies. The musicians include: Liz Cabrera, Joe D'Andrea, Dave Kleiner, Jeff Loy, Jeff Rantzer, Jean Rohe, Ralph Litwin, Frank Sole, Bill Meyer, Tom Pylant, Kirsten & Kris & John Lamb, Lew Gelfond, Dave Rimelis, Eric Shaberg, Darrell Courtley, Jim Speer, Dean Rickard, Beth Bachmann, Lynda Wright, Scott Kesselman, John Conte, Dave Cornell, Ken & Pat Rolston, David & Debbie Derr, Maggie Reilly, Jerry Sullivan, Pamela Feehan, Diane Grabowski, Don MacGowan. Co-producers Ken Galipeau and Paul Gallagher. CD includes all lyrics and comments by Ken and Les Barker. "History Man" (an anti war song) has been recorded by Hillary Spencer. "The Railways of New York" (a love song) was sung by Jack Hudson on the recording "Twilight of the Dogs" and sung by Christine Deleon and others. "Can't Find My Invisibility Cloak" was included on the recording "CATNAV"
"Heroes" is a song about the real heroes of 9/11 that people have requested a recording of. I was initially drawn to reciting Les' funny poems and found I was inspired to sing his serious poems and then his funny ones as well. These are funny and serious poems that called to me and said "I want to be a song".
! ! ! PayPal now accepts credit cards without creating an account ! ! ! 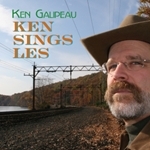 Order "Ken Sings Les" online using a credit card or PayPal. Order "Fishin' With Ish" online using a credit card or PayPal. Order "The Garden State" online using a credit card or PayPal. Order "Collection" online using a credit card or PayPal. Order "Ken Sings Les - THE DEMO" online using a credit card or PayPal. Download "Ken Sings Les" from iTunes. Download "Fishin' With Ish" from iTunes. Download "The Garden State" from iTunes. Click here for a printable order form and pay by mail with a check. All website content ©2005 Ken Galipeau. All Rights Reserved.